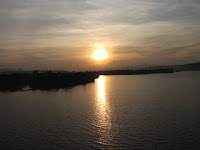 Watched the sun rise, as the train sped fast over the Sharavati River on the longest bridge in Konkan Railway near Honnavar in Karnataka. Chatted up to a British family who shared my sentiments regarding Kovalam. A fellow passenger was kind enough to share ‘dope’ on Goa – what to see and where to go. Vital information which came in much handy, later! 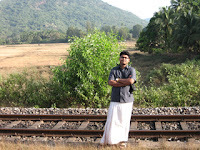 Got down the train and posed for snaps as we waited long for a train to cross us. The almost deserted train trundled into Madgaon around 11am. 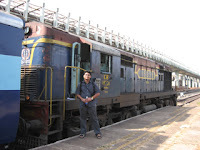 Posed for a pic next to the Kalyan WDM2 with my backpack, Pepsi bottle, et al. Trudged straight into the reservation office, to book my return ticket to Kannur (Cannanore) in North Kerala. Was told that all trains were full. So took a ticket to Mangalore which is close to Kannur. Got a bike taxi outside Madgaon Station. The driver, a Keralite himself, added onto the useful knowledge accumulated on Goa. Made my travel plans on the bike. He insisted that I take notes! It was going to be North Goa. Travelled from Madgaon to Kadamba bus stand. From there to Panjim. And then decided to take life on the road as it came. The ride to Panjim was exciting. The landscape bore much semblance to Kerala. Kingfisher billboards adorned the landscape… wherever you went there was Kingfisher. A fitting tribute to Goa – the land of good times. And then there were the Hutch hoardings. Wherever you go, our network follows. Very much ironical, as my Hutch connection never worked outside Kerala. Thus, Hutch hoardings were always an eyesore. Met a lady on my bus ride from Panjim to Miramar, where I wanted to stay. She too became my ‘Goa Guide’. Like providence would have it, I got dropped right in front of the Miramar Residency, at the Miramar beach. Checked into a cosy cottage. 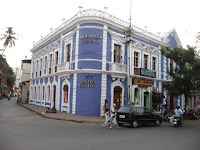 Had lunch and then explored Panjim in the afternoon. 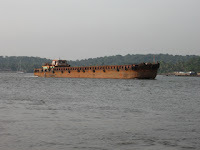 Took a ride on the Mandovi River in a ferry. Even indulged in some shopping. Scoured Panjim’s lanes for the famed INOX theatre. Finally discovered it and watched Kabul Express. So-So. Decided to hit Calangute next day. Type ‘Goa’ or ‘Konkan’ in the ‘search tags’ field in the top right corner and click ‘Go’.